Lime juice is an invaluable flavoring agent in a diverse array of foods, as well as an important ingredient in many mixed drinks. Most likely originating in India, limes made their way to Europe at some point during the centuries of the Crusades and probably traveled to the Americas along with Columbus. In addition to being a long-popular flavoring tool, lime juice was put into practical use by scurvy-plagued British sailors in the 1800s. Sailors of the Royal Navy and British merchant ships earned the nickname “Limey” when a daily dosage of lime juice became a mandatory inclusion in their rations. Though less prevalent, lemon juice was sometimes also used to prevent scurvy, and it wasn’t until the 1923 discovery of vitamin C that the reason behind the benefits was discovered. There are two primary lime varieties available in the U.S., as well as various packaged lime juices. Tahitian Limes, including the Bearss and Persian varieties, are the most common. They are large and seedless, and while their skin displays a pale yellow color when fully ripened, their juice has better flavor when the limes are still green. Key Limes, also referred to as Bartenders Limes, are sometimes hard to come by, but they might be worth the hunt. They sport a bright yellowish skin, generally thinner than that of ripened Persians. Notably smaller and rounder than Persian limes, they are very aromatic and acidic, and their abundant juices offer a more powerful flavor. However, these limes are higher maintenance: extremely temperature-sensitive and quick to dry out. 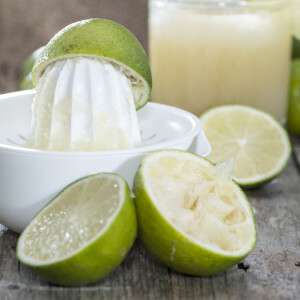 Packaged lime juice is also available frozen and bottled, both sweetened and unsweetened, though the nutrition value and taste are inferior to those of fresh lime juice. 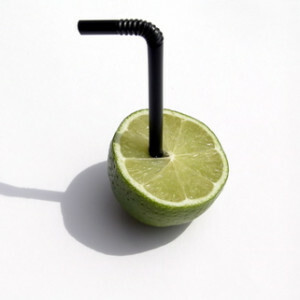 When buying fresh limes for juicing, look for bright colors: rich green Tahitian limes and greenish-yellow Key limes. Heaviness and thin, firm skin are also indicative of a juicy lime. Brownish “scars” on the skins do not indicate an inferior juice quantity or taste. When using lime juice in drink-mixing, it might be handiest to squeeze the whole night's worth at once to chill and use as-needed. For longer-term storage, freeze fresh-squeezed lime juice in an ice cube tray and then move the cubes into plastic baggies where they can be preserved frozen for four months. A medium-sized lime yields approximately 1 oz. of juice. To yield the most juice, limes should be room-temperature or warmer. Limes can be heated in hot water, at a low oven temperature for a few minutes, or zapped in the microwave for 15-30 seconds. Careful, though: too much heating will boil the juice. Roll the lime under your palm on a hard surface to soften it before juicing. A variety of fruit-juicing tools are available for purchase, although simply squeezing half a lime with your hand also works effectively. You might find it easier to juice the limes if you zap them for 15 seconds in the microwave.